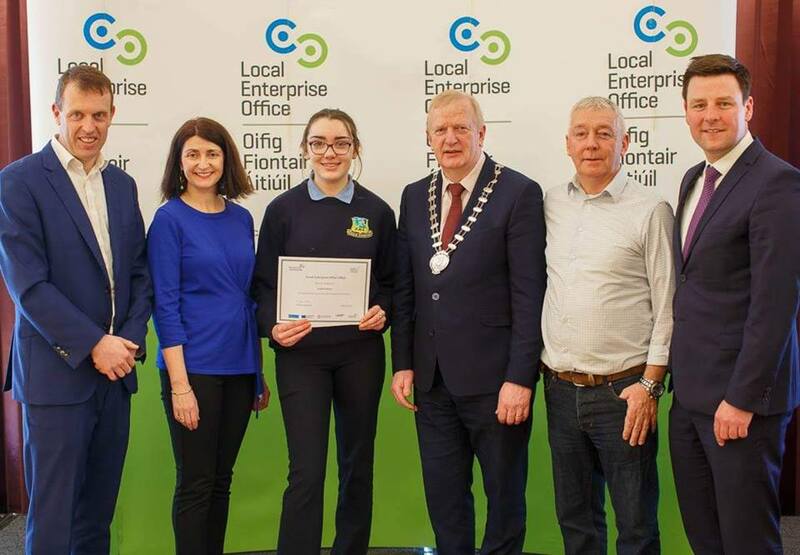 Enterprise is alive and well in Ard Scoil Chiaráin Naofa. Niamh McKeon claimed the overall prize in the county final yesterday – an outstanding achievement for the TY student. 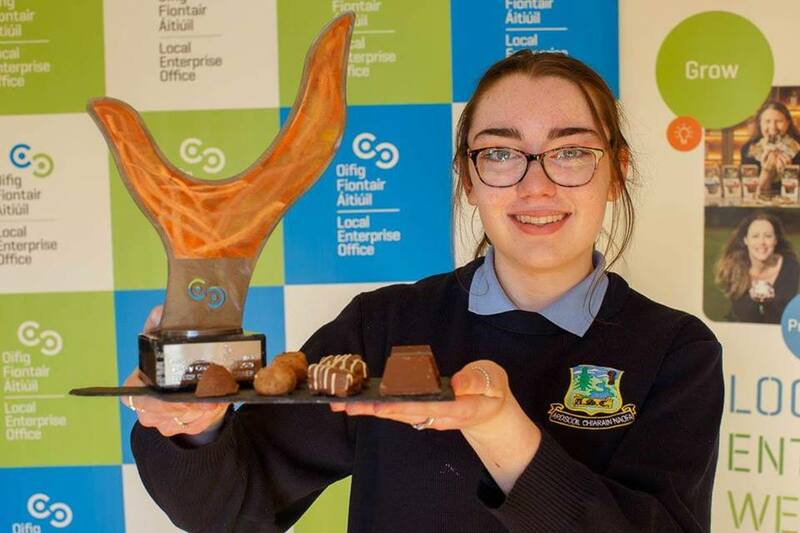 Niamh is a sole trader and responsible for all aspects of her business, Dolce Chocolates. She makes handmade deluxe chocolates in a variety of flavours. Niamh has worked tirelessly to ensure the success of her business, and has done herself and her school very proud. It’s off to the national final now in Croke Park in May. 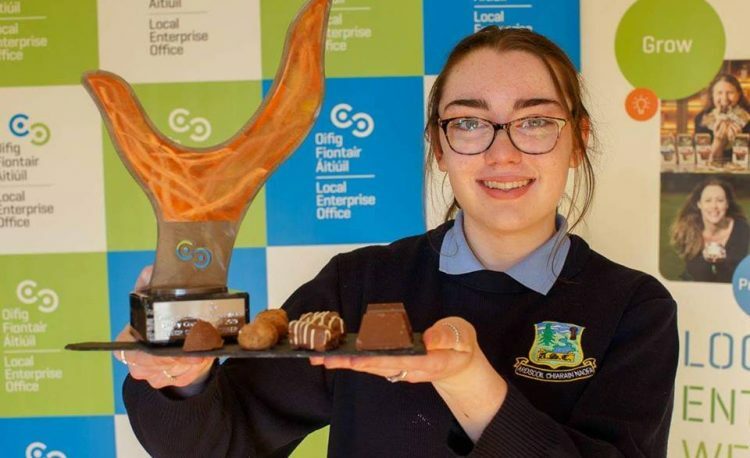 We wish Niamh and her business every success in the National final. Niamh wasn’t the only success on the day for ASCN. The Epoxyworks team of Stephen Roe, Patrick Phelan, Luke Kennedy and Jack Reynolds won a Special Recognition for Craft award. Epoxyworks is a craft business that produces handcrafted products using epoxy glue. Products vary and range from clocks to bespoke tables. These students have worked very hard on their business and, as a result, helped to make yesterday a memorable day for ASCN by claiming the Craft award alongside Niamh’s success. Well done boys and best of luck with the business. 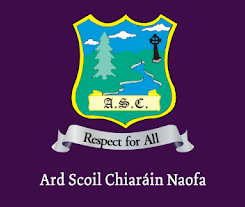 HD Frames also represented Ard Scoil yesterday at the final and have done themselves very proud. These students produce bespoke scrabble frames made to order. Well done boys. Keep up the good work. Huge credit also has to go to Ms Guinan and Ms Murray who have put a huge effort into assisting and guiding the TY students. AIT is an award-winning higher education institution located in the heart of Ireland. Ard Scoil Chiaráin Naofa Clara shared a post. Copyright ©2019 ASCN Clara. School Zone by Rara Theme. Powered by WordPress.